How will future astronauts live on Mars? This is the question asked by NASA and many of the organizations working toward the advancement of human spaceflight. The challenges of landing and living on another planet are difficult to recreate on Earth. In order to do this, NASA and other space organizations use analog studies to prepare for the future challenges space explores might face. Many of these studies take place in remote or hostile places on earth that are similar to those found on the Moon or Mars. One of those analog studies is the Hawai‘i Space Exploration and Analog Simulation, or HI-SEAS. 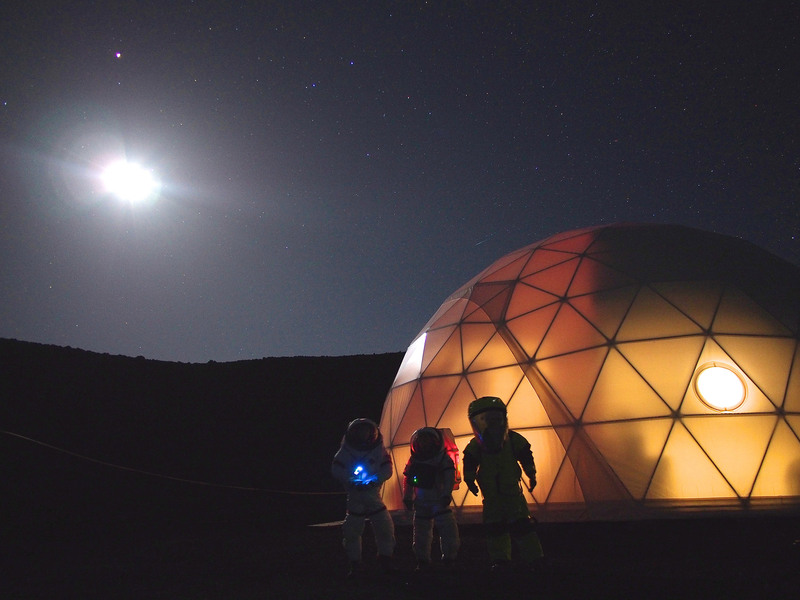 Operated by the University of Hawaii at Manoa, the HI-SEAS program places six researchers in an isolated habitat module for the purpose of studying the methods of living on Mars over a long period of time. The first mission, which ran for four months in 2013, focused on developing recipes and methods of preparing food for future astronauts. That mission ended in August of 2013, and a new crew entered the habitat in March of 2014. During this current mission, the crew has been participants in a number of studies that will be used to evaluate their group dynamics and psychological health. 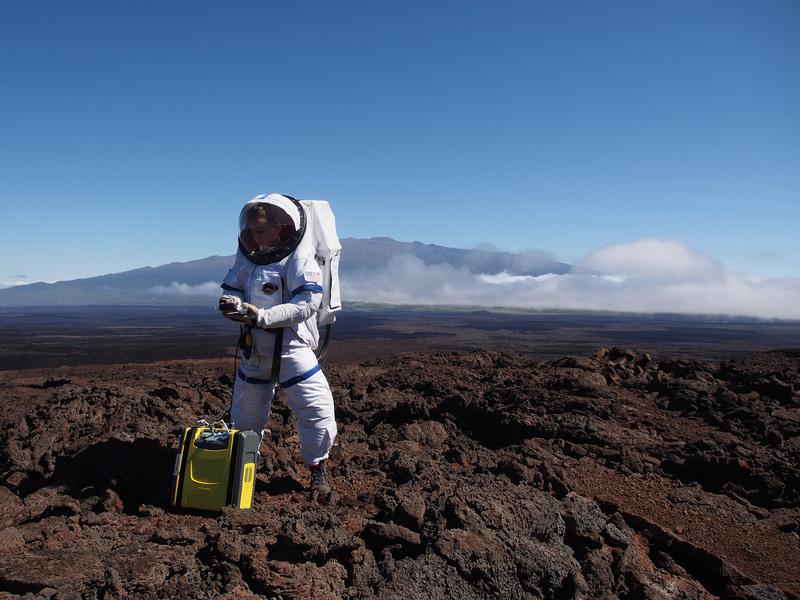 The University of Hawaii at Manoa, through grants provided by NASA’s Human Research Program (HRP), is investigating the crew’s performance throughout the mission. These studies measure their effectiveness as a team, how they react to stress, and their behaviors in a closed environment. The history of exploration is littered with examples of expeditions whom succumbed to failure because of human factors. Several different studies are being conducted simultaneously to monitor the crew throughout the simulation. Several times a day, each crewmember completes surveys from the participating universities that record information about each individual’s health, sleep habits, and emotional states. Each of the crew wears two electronic sensors as well. The first, worn on an armband, records biometrics. The second, worn like a necklace, senses the proximity of the crewmembers to each other, the intensity of their interactions, and the volume of their voices. All of the data from these devices is regularly downloaded and transmitted to the anxious university science teams. One of the elements of long duration space missions is the isolation the crew will experience. Many millions of miles from Earth, the crew will be alone except for themselves. How will they cope with this? In order to replicate this in the HI-SEAS analog, the crew lives in a structure designed to simulate a habitat module not unlike ones future Mars explorers will likely inhabit. The module is a two-story geodesic dome, inside of which is everything the crew will need to survive for a lengthy mission. 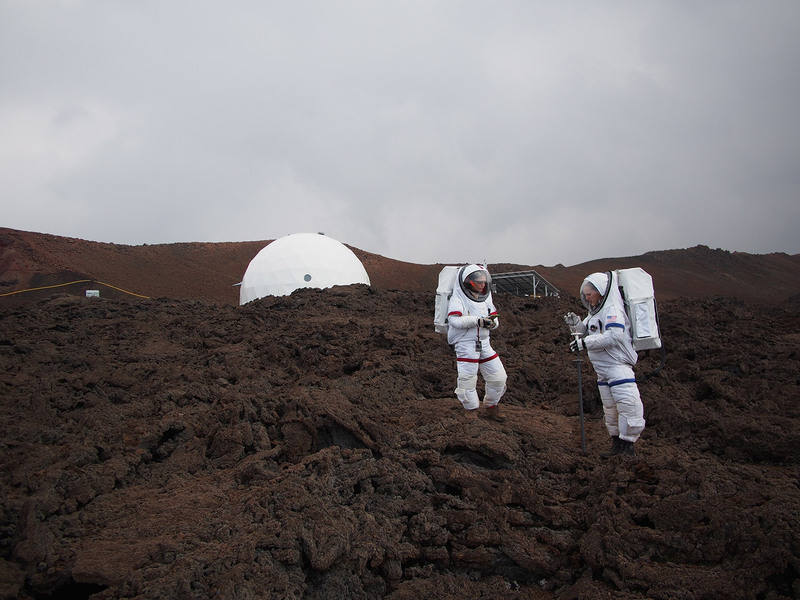 To further enhance the sense of isolation, the habitat module is located high on the slope of Mauna Loa, an enormous shield volcano on the island of Hawaii. This has the advantage of distancing the crew from civilization, and being an environment much like that of the Martian surface. Like all simulations, there are elements of reality that cannot be effectively duplicated. For instance, in the case of HI-SEAS and other Mars analogs, there just is no manner in which to replicate Mar’s gravity – which is approximately 38% that of Earth’s. The crew must also must contend with terrestrial weather patterns, which are a might bit wetter than those found on Mars. The weak Martian atmosphere only has one percent of the pressure that Earth’s does, but the only manner in which to simulate that is to maintain a mental block on the desire to venture outside the habitat. One aspect of living on Mars that can be replicated is the distance between the planets, or at least the time it would take to communicate with the crew. Mars is far enough from Earth that it takes 20 minutes for radio waves to reach the fourth planet even at the speed of light. Two way conversations are not possible, so NASA has instituted an artificial delay into the computer network used by the HI-SEAS crew. All messages sent to mission support take 20 minutes to arrive. And it takes another 20 minutes to receive a response. This can be a nuisance, but adds to the fidelity of the simulation. In fact, the only way the crew can exit the habitat module during the mission is wearing an analog spacesuit for EVAs, or “Extra Vehicular Activities”. Like real astronauts on Mars, the crew wear spacesuits to exit the breathable atmosphere of the habitat and venture out into the inhospitable Martian landscape. Temperatures on Mars can reach as low as -183 F below zero, and there simply isn’t enough oxygen available for complex life-forms. Although it is perfectly safe to be outside in Hawaii, the crew must adhere to the premise to maintain the simulation. 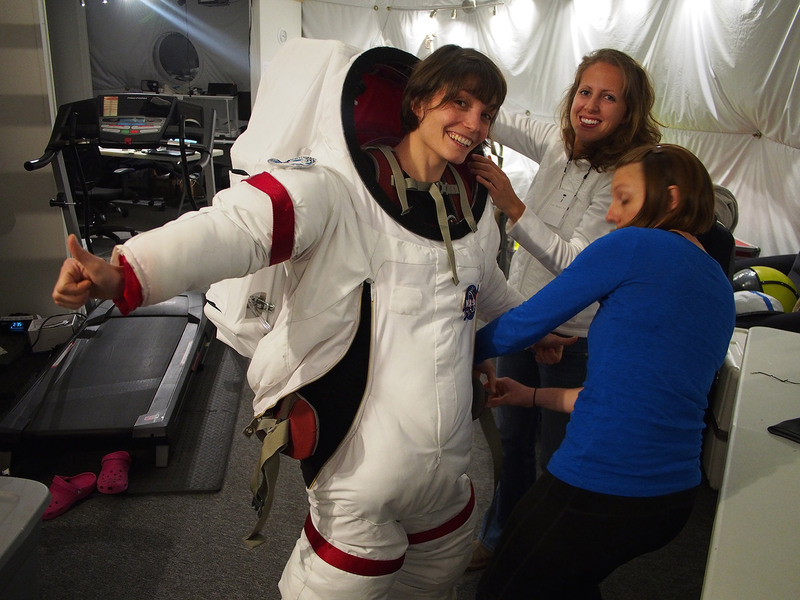 Astronauts on Mars will want to go outside on EVAs for a number of reasons. Some will be for chores like maintaining their habitat systems or rovers, others may be as adventurous as exploring lava tubes and searching for signs of life. 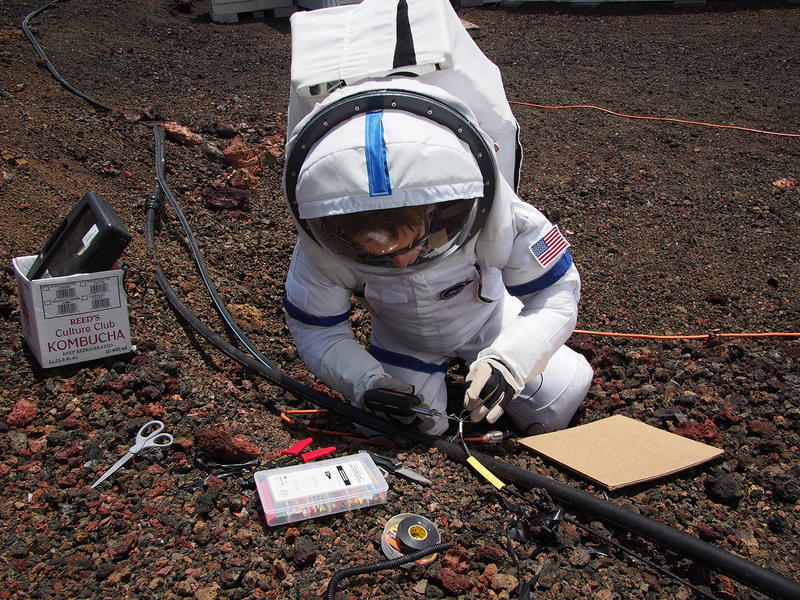 As part of the HI-SEAs program, the crew must conduct regular EVAs to monitor habitat power systems and explore the vicinity of the “landing site” to catalog the geology and search for features that are similarly found on Mars. These simulated EVAs provide the psychologists studying the crew’s team performance with opportunities to evaluate their effectiveness during difficult tasks. Another element of the HI-SEAS simulation is the dynamics of the crew. NASA and the other space agencies are investigating the types of people whom will one day be selected to go to Mars. The HI-SEAS crew were selected from a pool of more than 700 qualified candidates, all of whom had to meet the minimum criteria required of NASA’s astronaut corps. Efforts were made to select individuals for their educations, skills, and compatibility. Future Mars explorers will be required to well-rounded individuals, in terms of their educations and experience. The crew selected for the HI-SEAS analog was chosen not only for their scientific backgrounds, but for their personalities and resourcefulness as well. Astronauts traveling to and living on Mars will be required to spend great lengths of time in small spaces with other people. Compatibility is as important trait for future astronauts. Special care was given to selecting candidates that possessed the ideal combination of talents and character. The current HI-SEAS crew is a diverse collection of international researchers. The Mission Commander is Casey Stedman, a U.S. Air Force navigator, veteran of the wars in Iraq and Afghanistan, and a graduate student studying human factors in aeronautics. The Medical and Life Support Officer is Tiffany Swarmer, a graduate student from the University of North Dakota’s Space Studies program. Systems are the responsibility of Ross Lockwood, the mission’s Chief Technologist. He is a doctoral candidate from the University of Alberta studying experimental physics. The Chief Engineer is Annie Caraccio, a chemical engineer from NASA’s Kennedy Space Center. The crew has their own Mission Psychologist, a Dr. Ronald Williams of Bloomington, Indiana. And the Chief Scientist is Lucie Poulet, an aerospace engineer from France working for the German aerospace center DLR. Each crewmember has been accomplishing individual research projects during the mission. Most of these studies are concentrated on developing ways for future astronauts to survive on long duration planetary missions. Caraccio is diligently recording all of the waste produced by the crew and as part of her “Trash-to-Gas” experiment. Data from this research will help engineers at NASA better understand methods for recycling food, garbage, and materials waste into fuels for future missions. Similarly, Poulet has planted a number of seeds that have previously flown in space on the Long-Duration Exposure Facility (LDEF) satellite and is experimenting with growing them under different wavelengths of light. Future Mars explorers will likely have greenhouses for glowing food plants, but scientists must first understand how seeds will react after having been in space for long periods. The greenhouse device being used in the HI-SEAS habitat is a precursor to the VEGIES unit that launched to the ISS earlier this year. Things people take granted on Earth in our daily lives become precious even in this simulated environment. 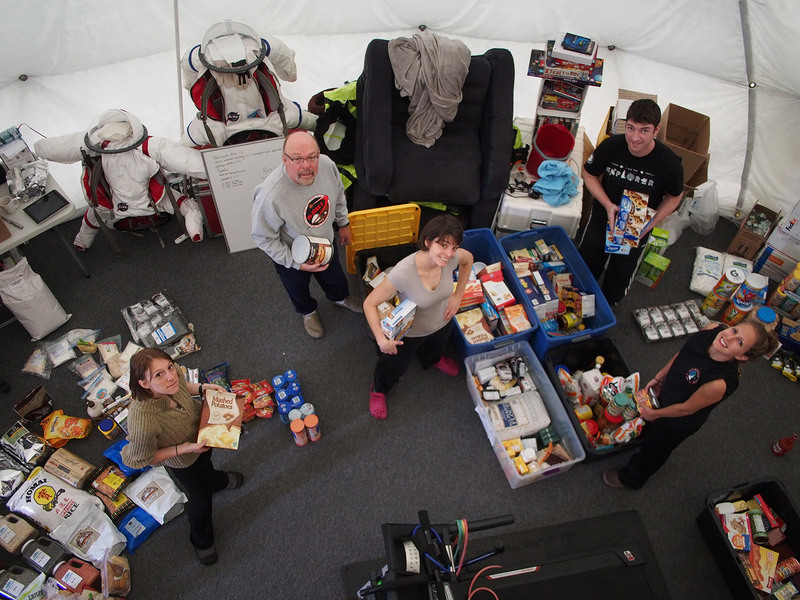 Like real astronauts on the International Space Station or those who explore other planets, the HI-SEAS crew must be careful to monitor and ration food, water, electricity, and supplies. Food must be carefully inventoried and divided, every watt of electricity generated by the solar cells must be accounted for, and the use of water is especially monitored. Every effort must be made to use water sparingly. Showers for each crewmember are limited to eight minutes per week. Everything needed to survive this mission had to be brought by the crew to the habitat- just as the first astronauts on Mars will experience. There have been other analog studies that focused on the development of specific technologies, or situated the crews in a particular environment in order to demonstrate concepts in harsh locales. What makes HI-SEAS unique is that this study is to determine the limitations of the human element. Some pessimistic critics believe that human spaceflight is doomed to failure because humans are inferior to robotics and computers. If HI-SEAS and similar Mars analogs prove anything, this is an absolutely false assumption. Unlike machines, a human crew can react to unexpected events without having to be reprogrammed to do so. Automation has limitations. Like future Mars missions, the crew of HI-SEAS cannot confer with mission control immediately when problems arise. The distance between Mars and Earth means the crew must be able to react to a crisis without waiting for instruction to be passed. Robots and rovers do not yet have the ability to do this. Machines can’t yet experience the emotions like fear, anticipation, or compassion- things that humans have developed that keep us alive. The perceived weaknesses of humans are the actually the advantages we need in order to survive a mission on Mars. Analog studies like HI-SEAS are essential for scientists and engineers to learn what is necessary to survive future mission to Mars. Only from testing the methods and technologies required in a realistic environment can solutions the problems that plague long-duration missions be uncovered. For the second HI-SEAS crew, the four months of rationing resources, isolation, and time spent away from friends and family will one day benefit future astronauts living and working on the surface of Mars. Annie Caraccio checks her gear during an EVA. Credit: Ross Lockwood. To learn more about the crew of the HI-SEAS mission, read our companion article here.